John Kaercher Jr. was born circa 1858 at Minnesota. [S248] U.S. Federal Census 1860 U.S. Federal Census, by Ancestry.com, Page 6. Dwelling 44. Aaron Benjamin Kaercher was born on 20 January 1860 at Preston, Fillmore, Minnesota. Aaron Benjamin Kaercher married Gertrude Martha Johnson, daughter of (?) Johnson, on 20 February 1881 at Clear Grit, Fillmore, Minnesota. Aaron Benjamin Kaercher died on 6 February 1922 at Big Stone, Minnesota, at age 62. Aaron Benjamin Kaercher purchased land on 25 October 1888 at Township 121N Range 46W, Minnesota, Section 16, Land Office Benson, Total Acres 158.5; Document Number 1828. Circa 1898 A. B. Kaercher is an attorney of Ortonville, Minnesota. He was born at Preston, Fillmore County, Minnesota, on January 20, 1860. His father, John Kaercher, was engaged in the milling business at Preston. Mr. Kaercher, senior, was a native of Strassburg, but was brought to Canada by his parents when an infant. He was left an orphan at an early age, and was thrown largely upon his own resources, and achieved a large measure of success entirely through his own industry, ability and indomitable will. He came to Fillmore County when a young man and laid out the village of Preston, building the flour mills at that place, and at the age of twenty-five was one of the most prominent business men in Southern Minnesota. He now resides near South Bend, Washington. His wife was Barbara Kraemer, who was also a native of Strassburg. Mrs. Kaercher died January 12, 1865, at Preston. Aaron was one of six children. His early education was limited. He attended the graded schools at Preston until fifteen years of age when he entered his father's office as bookkeeper. After three years he went into the mill as apprentice and learned the trade, and when nineteen took charge of the flouring mill at Kendallville, Iowa. Later he returned to Minnesota, and in 1881 went with his father to Big Stone City, Dakota. Within a short time they began the erection of a mill at Ortonville, Minnesota, and a few years later entered upon the project of dredging a canal to connect Big Stone Lake with Lake Traverse. After expending sixty-five thousand dollars and not receiving the assistance promised, they found the undertaking beyond their means and were obliged to abandon the scheme for a time. In 1884 Mr. Kaercher began the study of law and pursued it at leisure moments until 1890, when he was admitted to the bar. He at once moved to Browns Valley and formed a law partnership with A. S. Crossfield. In the political campaign of that year Mr. Kaercher took a very active part, and to further his efforts he established a newspaper, "The Traverse County Times," published at Wheaton. This adventure was followed a few years after by the establishment of the Big Stone County Journal at Ortonville, which he controlled. page 263. [S245] U.S. Federal Census 1900 U.S. Federal Census, by Ancestry.com, ED132. Dwelling 8. [S243] U.S. Federal Census 1920 U.S. Federal Census, by Ancestry.com, ED7. Dwelling 98. [S337] Ancestry.com, Naturalization Index, p.263-264. Name Variation Anna Mariah Hanson was also known as Annie. Married Name 28 September 1876 As of 28 September 1876,her married name was Kaercher. Anna Mariah Hanson was born circa 1851 at Norway. She married John Michael Kaercher, son of Michel Kaercher and Madeleine Magdalena Schweitzer, on 28 September 1876 at his 3rd marriage, Preston, Fillmore, Minnesota, she was the nanny/housekeeper for John and Eliza. Edna I. Kaercher was born in 1879 at Fillmore, Minnesota. She was the daughter of John Michael Kaercher and Anna Mariah Hanson. Edna I. Kaercher died circa 1895 at drowned. John Lee was born on 2 August 1839 at County Meath, Ireland, also reported as Aug 1844. He married Katherine J. Hogan on 29 November 1872 at Minneapolis, Minnesota. John Lee died after 1915. In 1915 at Minnesota History and Biography article. [S246] U.S. Federal Census 1880 U.S. Federal Census, by Ancestry.com, NA Film Number T9-0622. Sheet 467D. Name Variation Katherine J. Hogan was also known as Kate. Name Variation Katherine J. Hogan was also known as Katie. Married Name 29 November 1872 As of 29 November 1872,her married name was Lee. Katherine J. Hogan was born in January 1853 at Rhode Island. She married John Lee on 29 November 1872 at Minneapolis, Minnesota. Katherine J. Hogan died after June 1900. Katherine J. Hogan had 4 with 4 living in 1900 children. Dr. John W. Lee Jr.
Dr. John W. Lee Jr. was born in April 1878 at Minnesota. He was the son of John Lee and Katherine J. Hogan. Name Variation James Edward Lee was also known as Edward James. James Edward Lee was born in April 1880 at Minnesota. Married Name Her married name was Cromeenes. Anna (?) married Benjamin Cyrus Cromeenes, son of Syrus Quintillion Cromeenes and Hannah Elizabeth Williams. Anna (?) was born circa 1894 at Illinois. Hanna Cromeenes was born circa 1917 at Illinois. She was the daughter of Benjamin Cyrus Cromeenes and Anna (?). Lester Cromeenes was born circa 1902 at Illinois. Otece Cromeenes was born circa 1905 at Illinois. Pearl Cromeenes was born circa 1913 at Illinois. She was the daughter of Ulysus S. Cromeenes and Effie Murphy. Alice Cromeenes was born circa 1915 at Illinois. Theophilus Scott married Sarah A. (?). Theophilus Scott was born circa 1847 at Illinois. [S243] U.S. Federal Census 1920 U.S. Federal Census, by Ancestry.com, ED99. Dwelling 145. [S250] U.S. Federal Census 1930 U.S. Federal Census, by Ancestry.com, ED76-6. Dwelling 55. Sarah A. (?) married Theophilus Scott. Sarah A. (?) was born circa 1857 at Tennessee. Name Variation Helen May Leech was also known as . Name Variation Helen May Leech was also known as Nelly M.
Name Variation Helen May Leech was also known as Nellie M. F.
Married Name circa 1898 As of circa 1898,her married name was Kane. Helen May Leech was born circa 1875 at Iowa. She was the daughter of Joseph W. Leech and Alice C. Bentley. Helen May Leech married William Francis Kane, son of Henry Kane and Mary McCollon, circa 1898. Helen May Leech died on 11 February 1956 at Brule, South Dakota. Helen May Leech had 5 with 4 living in 1910 children. [S246] U.S. Federal Census 1880 U.S. Federal Census, by Ancestry.com, NA Film Number T9-0326 Page Number 91A. [S244] U.S. Federal Census 1910 U.S. Federal Census, by Ancestry.com, ED72. Dwelling 65. [S250] U.S. Federal Census 1930 U.S. Federal Census, by Ancestry.com, ED8-3. Dwelling 56. [S9] South Dakota, South Dakota Birth Records South Dakota, File Date: September 17, 1941 (unknown file date). 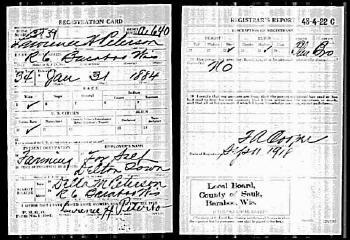 [S9] South Dakota, South Dakota Birth Records South Dakota, State File Number: 556564 (unknown file date). Name Variation Margaret Kane was also known as Frances. Margaret Kane was born circa 1909 at South Dakota. She was the daughter of William Francis Kane and Helen May Leech. Harry Kane was born circa 1905 at South Dakota. He was the son of William Francis Kane and Helen May Leech. Name Variation Laurence Hans Petersen was also known as Peterson. Name Variation Laurence Hans Petersen was also known as Lawrence Hans. Laurence Hans Petersen was born on 31 January 1884 at Wisconsin. He married Della Melissa Bethke, daughter of Charles E. Bethke and Emma Stevens, on 10 September 1910. Laurence Hans Petersen died on 30 August 1978 at age 94. Laurence Hans Petersen obtained US Social Security Card at Wisconsin; last residence Reedsburg, Sauk, Wisconsin; last benefit Baraboo, Sauk, Wisconsin. 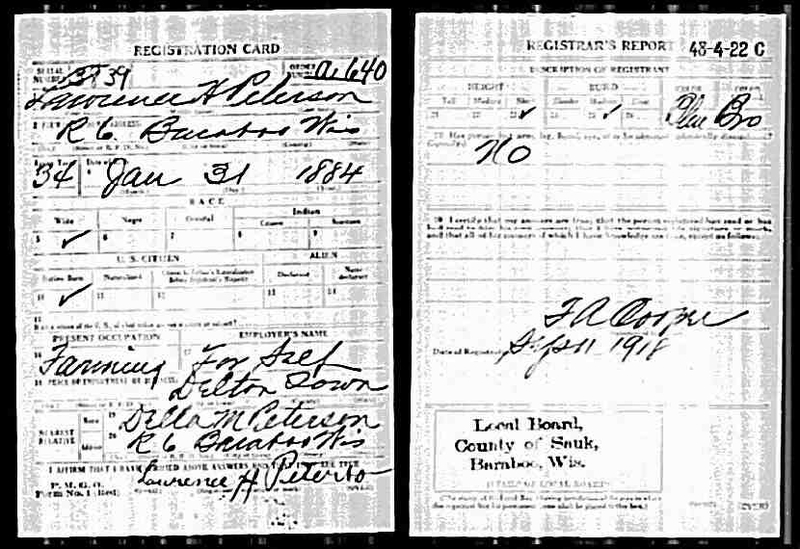 On 11 September 1918 at Sauk, Wisconsin, WWI Draft Registration. [S244] U.S. Federal Census 1910 U.S. Federal Census, by Ancestry.com, ED108. Dwelling 362. Married Name 10 September 1910 As of 10 September 1910,her married name was Peterson. Married Name 10 September 1910 As of 10 September 1910,her married name was Petersen. Della Melissa Bethke was born on 21 June 1890 at Baraboo, Sauk, Wisconsin. She was the daughter of Charles E. Bethke and Emma Stevens. Della Melissa Bethke married Laurence Hans Petersen on 10 September 1910. Della Melissa Bethke died on 5 August 1958 at age 68. [S245] U.S. Federal Census 1900 U.S. Federal Census, by Ancestry.com, Year: 1900; Census Place: Baraboo Ward 1, Sauk, Wisconsin; Roll: T623_1816; Page: 20A; Enumeration District: 125. [S244] U.S. Federal Census 1910 U.S. Federal Census, by Ancestry.com, Year: 1910; Census Place: Baraboo Ward 1, Sauk, Wisconsin; Roll: T624_1736; Page: 4A; Enumeration District: 0105; Image: 637; FHL Number: 1375749. Married Name 20 July 1947 As of 20 July 1947,her married name was Garske. Virginia M. Peterson was born on 18 May 1918 at Wisconsin. She was the daughter of Laurence Hans Petersen and Della Melissa Bethke. Virginia M. Peterson married Herbert Edward Garske, son of Henry Garske and Ida Schwantz, on 20 July 1947. Virginia M. Peterson died on 19 May 1990 at age 72. Edward Harold Peterson was born on 20 June 1920 at Wisconsin. Edward Harold Peterson married Arlene C. Foss on 6 December 1948. Edward Harold Peterson died in April 1985 at Illinois at age 64. Name Variation Harlan James Peterson was also known as Harland. Harlan James Peterson was born circa 1923 at Wisconsin. Harlan James Peterson married Jean A. Sweeney, daughter of Frank Sweeney and Vivien Waite, on 6 May 1943. Harlan James Peterson lived in 2006 at Madison, Dane, Wisconsin. Married Name 12 April 1947 As of 12 April 1947,her married name was Carlin. Evelyn Jean Peterson was born on 22 January 1928 at Wisconsin. Evelyn Jean Peterson married Elliot John Carl Carlin on 12 April 1947. Evelyn Jean Peterson died on 20 April 1978 at Sauk, Wisconsin, at age 50. Evelyn Jean Peterson graduated in 1945 at Reedsburg High School, Reedsburg, Sauk, Wisconsin. Married Name 20 September 1936 As of 20 September 1936,her married name was Whaples. Laura Emma Peterson was born on 3 August 1911 at Wisconsin. Laura Emma Peterson married Robert Bruce Whaples on 20 September 1936. Laura Emma Peterson died on 17 March 1970 at Illinois at age 58. Laura Emma Peterson lived in 1935 at Wisconsin Dells, Sauk, Wisconsin. [S373] U.S. Federal Census 1940 U.S. Federal Census, by Ancestry.com, Year: 1940; Census Place: Kewanee, Henry, Illinois; Roll: T627_812; Page: 1B; Enumeration District: 37-42. 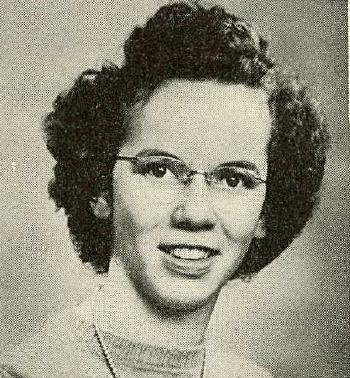 Dorothy M. Peterson was born in 1915 at Wisconsin. Dorothy M. Peterson died in 1923. Name Variation Silas James Seymour was also known as S. J.
Silas James Seymour was born on 21 February 1824 at Pompey, Onondaga, New York, also reported as 2 Feb 1824. He was the son of James Seymour and Susan Ostrander. Silas James Seymour married Mary Ann Conine, daughter of Derrick Conine and Abigail Bates, on 23 September 1851 at New York. Silas James Seymour died on 25 April 1899 at Reedsburg, Sauk, Wisconsin, at age 75 also reported as 24 Apr 1899. Hon. Silas James SEYMOUR, deceased, whose death occurred at Reedsburg [Sauk County, WI], 25 Apr 1899, was one of the most conspicuous pioneers of Sauk County, WI. During his residence there of half a century, he had been identified with many events of the utmost interest and importance to its people and fully merited the confidence which was unanimously reposed in him. Mr. SEYMOUR was born at Pompey, Onondaga County, NY, 21 Feb 1824. He was a son of James and Susan (OSTRANDER) SEYMOUR, and sprang from a family which has always been distinguished for the patriotic spirit of its members and their devotion to principles of integrity and honor. His grandfather, Zadoc SEYMOUR, was born near Hartford [Hartford County], CT. While a boy Zadoc SEYMOUR was bound out to a farmer in the neighborhood. Before reaching his majority, however, his father cancelled his indentures, whereupon he enlisted in the Continental army, being one of the first to do so, and spent six or seven years in the service. He went through the terrible winter at Valley Forge and saw much other hard service under the immediate command of George Washington. About 1798 he settled at Pompey [Onondaga County], NY, where he died about 1844, at the age of 88 years. He was a conscientious member of the Presbyterian church. His wife, Naomi MUNGER, was born in VT and died some years earlier than her husband, attaining the age of 75 years. They reared a family of five sons and five daughters, in which James was the third son and sixth child. He was born in Chenango County, NY, and lived for some years in Genesee County. He died at Covington, Wyoming County, NY, reaching the age of nearly 60 years. He was a devout member of the Congregational church and a public-spirited citizen. In early life he was a Democrat but became an Abolitionist when that question began to be agitited. His wife, who was born at Pompey [Onondaga County, NY], died about three years before her husband. Her father, Peter OSTRANDER, who was of Dutch lineage, came from Essex County, NY, and was one of the founders of the town of Pompey. His wife, Clarissa, was a native of CT. It is related as a curious coincidence, that at the time of their marriage this lady could not speak a word of Dutch nor her husband a word of English. One of their sons, Rev. Jared F. OSTRANDER, a Congregational minister, was one of the pioneers of WI, settling at Aztalan, Jefferson County, in 1836. He never accepted any remuneration [p 235] for his professional services, thereby demonstrating his disinterested zeal in the cause of Christianity. Silas James SEYMOUR, whose name heads this article, left home at the age of 14 years and was employed about two years on the Wabash and Erie canal in western OH, but as he suffered much from fever and ague, he returned to NY. Up to this time he had attended school but six weeks, but he now determined to obtain a better education and spent the two winters at school at Covington and Pompey. He then began teaching and spent several winters in that way, attending school in summer. While teaching at Manlius [Onondaga County], NY, he began using the "word method," since adopted by the most progressive teachers generally. This is the first instance known of the use of that method of instruction. In 1849 he determined to seek a home in the wilds of WI, and came to Sauk County to locate a claim. Walking from Madison to Reedsburg, he selected a farm in the present town of Dellona and continued on foot as far as the U. S. land office at Mineral Point to enter the same. At that time there were but five dwellings in Reedsburg [Sauk County, WI]. These were built of logs and shingled with bark. There was one other house between that place and his farm. This farm he cultivated until 1892, when he became a resident of Reedsburg. He was a practical land surveyor and for 40 years did more or less work in that line. When the Milwaukee & LaCrosse railroad was projected in that vicinity, like many of his neighbors, Mr. SEYMOUR mortgaged his farm to assist in promoting the enterprise. While the result of this action was not as disastrous to him as to many others, he took an active interest in trying to secure some relief for the sufferers and was appointed by Governor Smith one of the commissioners to dispose of certain lands, peviously in possession of the railroad company, for the benefit of mortgagers and labored diligently for several years to secure the best possible results from this fund. He was married 23 Sep 1851 to Mary Ann CONINE, daughter of Derrick and Abigail (BATES) CONINE. This lady, who still survives, was born in the town of Windom, Greene County, NY. Five children blessed their union, all of whom enjoyed exceptional educational advantages: (1) Ellen Augusta, who was engaged in teaching for several years, was born 19 Jul 1852, and died 25 Nov 1880; (2) Ida Jane, born 02 Mar 1855, died 27 Apr 1876; (3) Merton Eugene, a prominent farmer of the town of Dellona [Sauk County, WI]; (4) Walter Frederick, who is a graduate of WI University and of Chicago Medical College, is now a medical missionary in China; and (5) Arthur Romeyn, is an instructor of French at WI University, of which he is an alumnus. Mr SEYMOUR was a leading member of the Methodist church for a number of years. Before the organization of the Republican party he began to advocate its principles. He filled all the principal offices of the town of Dellona and served two terms in the WI assembly in 1876 and 1877. While a member of that body he introduced a bill providing for the establishment of the state board of health and labored diligently to secure its passage. The wisdom of this measure has since been repeatedly demonstrated. He was an active member of the Reedsburg Old Settlers' Association and his presence will be greatly missed at its annual gatherings. Possibly the first of eastern settlers to come to Dellona was Silas James SEYMOUR. He was a native of Pompeon, N.Y., his parents being James and Susan (OSTRANDER) SEYMOUR. In May 1849, leaving the civilization of the East behind, he came to Fort Atkinson where he had an uncle living. From there he set out for the Baraboo Valley and reached Portage, or as it was then known, Fort Winnebago. From there he was able to command a view far across the great reaches of eastern Sauk County, and selected a row of tall pines far in the distance, as his destination. (These were the pines which grew on the bluff known later as Pine Knob, northeast of the SEYMOUR farm.) Duly arriving in the vicinity he went to the house of Patrick MULLIGAN where he took his first meal in Sauk County. After searching several days in Winfield, on Babb's Prairie, and in Dellona for a desirable location, he selected land in Glen Valley, and departed for Mineral Point to enter same. While enroute he was thrown in contact with a gentleman riding overland horseback to enter land for some speculators. Reaching their destination together, Mr. SEYMOUR went immediately to the land warden's office where he entered his claim, while his mounted companion went to a tavern to dispose of his horse. A few minutes later, the latter entered the office and stating the description of his desired locations, mentioned first the identical tract that the warden had just written a grant for in favor of Silas J. SEYMOUR. Which proves it better sometimes to be afoot than horseback! Mr. SEYMOUR spent the winter of '49-50 in a log shack six by eight feet, east of the present boundary of the farm, but from an old letter, it is evident that he started to build upon the present homestead that same fall. In the spring of 1851 he went back to New York and married, returning to Dellona with his bride in August, of that year His wife's maiden name was Mary Ann CONINE, and she will be remembered as a woman of considerable learning. Mr. and Mrs. SEYMOUR were the parents of five children: Ellen Augusta; Ida Jane; Merton Eugene, married Blanche JEFFRIS of Baraboo, and occupied the homestead, where he still resides; Walter F., who became a Presbyterian Medical Missionary and spent thirty-five years in China, where he was shot during the Revolution of 1928; Arthur, who is a noted scholar and at the present time at the head of the foreign language department of the Woman's State College, Tallahassee, Florida. Married Name 23 September 1851 As of 23 September 1851,her married name was Seymour. Mary Ann Conine was born on 9 August 1827 at Windom, Green, New York. She was the daughter of Derrick Conine and Abigail Bates. Mary Ann Conine married Silas James Seymour, son of James Seymour and Susan Ostrander, on 23 September 1851 at New York. Mary Ann Conine died on 17 April 1909 at age 81 also reported as 07 Apr 1907. Name Variation Ellen Augusta Seymour was also known as Ella. Ellen Augusta Seymour was born on 19 July 1852 at Wisconsin. Ellen Augusta Seymour died on 25 November 1880 at age 28.